The Heliosheath is the solar wind piles up as it presses outward against the approaching wind in interstellar space. 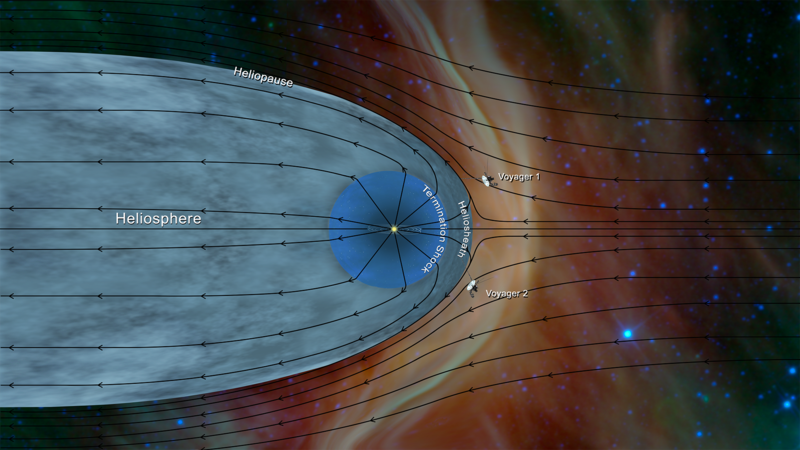 It seems the balance in pressure between Heliopause and interstellar wind causes the solar wind to turn back and flow down the tail of the heliosphere. PIA22835: Two Interstellar Travelers - Illustration shows plasma flow lines both inside and outside the heliopause. The direction of the solar plasma is different from the direction of the interstellar plasma. My main concern is the interstellar wind so strong and causes this phenomenon, why wouldn't the Voyager probes go backwards affected by the interstellar wind after they went beyond the Heliosheath Heliosphere? Or in fact they are gradually slowing down? No. The interstellar medium is almost a vacuum, just like the heliosphere. In fact, this is a lower pressure than we've ever created on Earth, at 1-1000 atoms/cm3, so 1020 times lower than atmosperic pressure on Earth. Not the answer you're looking for? Browse other questions tagged voyager solar-wind interstellar-medium or ask your own question. Does solar wind have any influence on probes? Is interstellar plasma a danger for future probes and astronauts?